RNAS Bramcote was indeed called HMS Gamecock, but was three miles outside Nuneaton Warwickshire, many miles from Nottingham. The Navy left in 1959 and shortly after,it was taken over by the Army who are still there in the form of 30th Signal Regiment. Warships of the Royal Navy have crowns as finials; a naval crown on the jack staff, and a royal crown on the ensign staff. They are made in three sizes; 8 inches, 6 inches and 4 � inches in diameter (205, 155, 115mms). His flag, which last flew on D-Day during the Second World War and has been in a private British collection for decades, was judged by experts to be of national importance. A spokesman for the Department of Culture said. 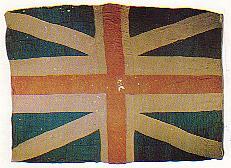 'This is the only surviving example of a command flag for the Admiral of the Fleet.' "
The painting "The Glorious First of June", by Philippe-Jacques de Loutherbourg (1740-1812) is shown on Wikipedia at http://fr.wikipedia.org/wiki/Fichier:Loutherbourg,_The_Glorious_First_of_June.jpg. It is noticeable that the claim made in the headline is not repeated in the text, and that the flag in the painting of the battle, although theoretically correct, is different from a photograph of the real flag. Lord Howe's command flag is probably the second oldest existing British naval flag, the oldest being the Standard of the Generals at Sea of the 1650s, which is in the National Maritime Museum.